"How sleep the brave who sink to rest, by all their country's wishes blest"
Beneath this mound lie the remains of 34 confederate soldiers Which were disinterred from the Alexandria Soldiers' Cemetery (Federal) and reinterred in this ground on the 27th day of December, 1879, under the auspices of the Southern Memorial Association, of Alexandria, Virginia. William Bambury, Lieutenant, 42 Miss. ; Wm. T. White, Sergeant, 3 N. C. William J. Frolic, Sergeant, 25 S. C. ; Daniel V. Frazier, Corporal. 7 S. C. H. L. B. Fleming, 25 S. C. ; G. S. Herron, 7 S. C. ; Henry G. Proctor, 25 S. C, Erastus W. Hay, 25 S. C. : Wm W. Taylor, 25 S. C. ; Henry A. Storm, 14 S. C. David Rogers, 1 S. C. ; Charles Firtich, 25 S. C. ; Thomas W. Montgomery, 25 S. C, Jacob W. Redmon, 25 S. C. ; Abner M. Bozhardt, 11 S. C. ;.Gambriel Cox, iN.C. Westley W. Skipper, 30N. C; Anderton Brown, 3 N. C; LemuelCheeney, 44 N. C. Ashbury Tarpley, 12 Miss. ; John Carter, 10 Fia. ; James E. Elder, 25 Tenn. Robert J. Morris, 16 Miss. ; R. Pittman, 60 Ga.; James M. Stuart, Corporal, 48 Va. Alexander Lyles, Richardson's Battery, Va. ; Gustavus W. Portlock, 61 Va. John Bennet Davis, Partizan Ranger, Va.; James Augustine,. James Cox, and Thos. T. Royal. A lieutenant and one private unknown. (Daniel A. Keever, Sergeant, 25 S. C). These men were prisoners of war who died in Federal Hospitals in this city. 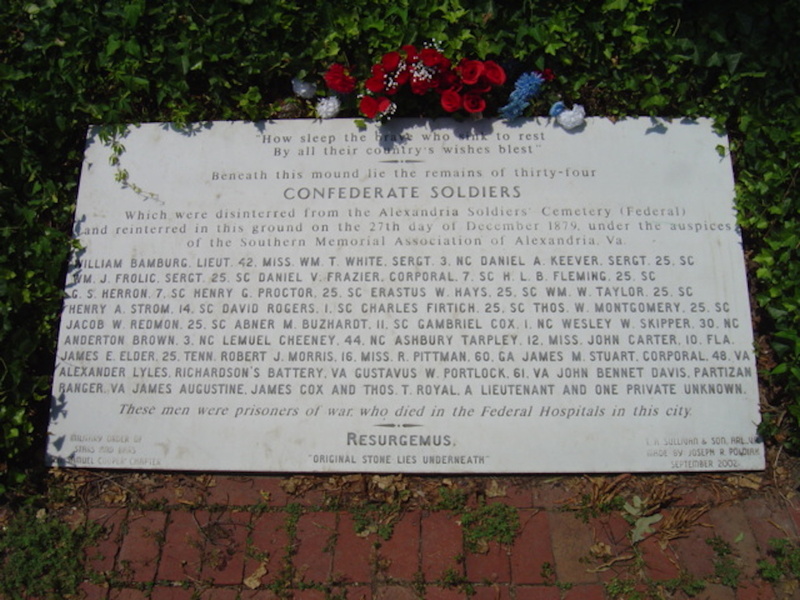 How do the words on the plaque of Confederate Mound regard the Confederate war dead buried there? What details on the plaque make you think that?